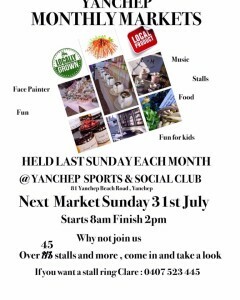 Don’t forget the Yanchep Monthly Markets are on this Sunday at Yanchep Sports and Social Club. Starts at 8am and finishes at 2pm. Tgere will be over 45 stalls and more so go and take a look and support your local businesses as well as the Sports Club.